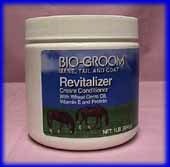 Demineralizer Conditioner. Concentrate formlated to be used straight or dilute 20 to 1. Silk and panthenol penetrate hair and skin, moisturizing and adding body to hair. Neutralizing the hair by demineralizing, it can last for more than a week. After rinsing hair will be left ultra clean, almost virgin state. 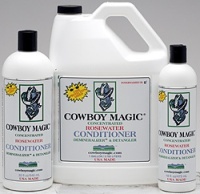 Rosewater Conditioner. Concentrate formlated to be used straight or dilute 20 to 1. Detangler & Shine. 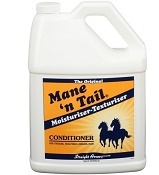 Conditioner concentrate results in a high shine after brushing. Detangles as you rub it in, keeps on working, resulting in less grooming time and less product used, saving time and money. A deep conditioner, restoring moisture, strengthening hair. Repels dirt, dust and sand, non oily, minimizes hair loss. A small amount goes long, long way. Super Bodyshine is formulated to reflect a natural prism of light for a maximum shine under sun. Leaves hair looking "silky shiny bright"